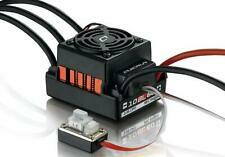 Motor Limit - 2S LiPo or 6S NiMh 540 or 550 Size Motor: 12T or RPM 30000 - 7.2V. 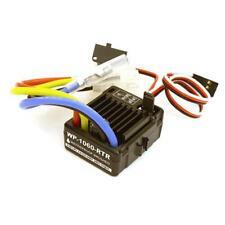 Motor Limit - 3S LiPo or 9S NiMh 540 or 550 Size Motor: 18T or RPM 20000 - 7.2V. Compatible Motors - Brushed Motors. Helpful Links. 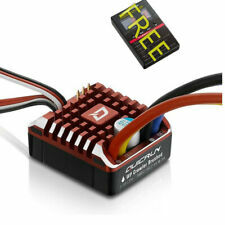 Hobbywing QuicRun WP Crawler Brushed ESC Features ESC Programing via. Waterproof: Waterproof. Separate Programming/Fan Port. Super Internal BEC. View Our Categories. Weight: 58.5g (w/Wires). Size: 36.2x31.6x17.0mm. 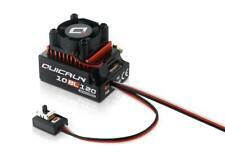 , EzRun series & QuicRun series of brushless car ESCs. This LED program box is for programming HobbyWing brushless ESCs. Its friendly interface makes ESC programming easy and quick. It works with the following HobbyWing products. Hobbywing EZRUN 4268 Brushless 2600KV Motor 4 Pole 5mm Shaft 1/8 RC Touring Car. 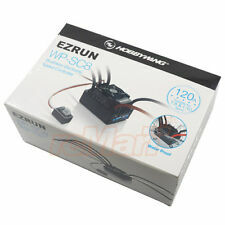 Hobbywing EZRUN MAX6 V3 160A WP Brushless ESC 1/6 1/7 RC Car 4x4 Truck Buggy EP. This LED program box is for programming HobbyWing brushless ESCs. 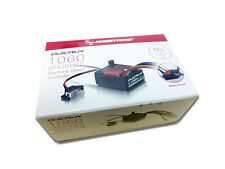 It not only carries forward the outstanding quality of HOBBYWING products but simplifies the operation. 1 Set x 1/10 Brushless Sensored 120A ESC. For: 1/10, 1/12 scale touring cars, buggies, and F1. Size: Approx.33 x 28 x 31.5mm (with Fan). Hobbywing HWA30203200 Platinum Pro 80A V4 ESC Premium Aircraft ESC Specifications: Application: 450L-500 Class Helicopter Input Voltage: 3-6S Lipo Cont./Peak Current (10s): 80A/100A (Switch-mode) BEC 5V-8V Adjustable: (Step: 0.1V), 7A/18A Cont./Peak Separate Programming Port: For connecting LCD Program Box/WIFI Express Output connector 4.0mm Gold Connectors (Female) Size 84.3x38.2x20.